The 238 footprint is the kitchen, 429 is the kitchen and dining room together. I think this is a very reasonable estimate for a job this large, it works out to be about $8.75 per square foot for finishing both rooms, which is an average cost for new wood flooring. He would also jack up the sunken floor joist in the kitchen and put all the shoe molding back on in the dining room for this price. I'm saving a little money by scrapping plans to put tongue and groove on the ceiling, getting a killer deal on cabinets, and buying a free-standing range as opposed to a slide-in. What do you think? I think it sounds like you've already decided to get wood floors :-) If you get something you aren't really happy with (like linoleum), you will focus on it every time you walk in the kitchen. I'd save up for the wood floors if that's what you really want. When it comes major pieces of the renovation that aren't easily changed down the road (like flooring), don't settle on something you don't like. Don't install linoleum if it's going to cause you regret. There's nothing worse than finishing a major renovation and being unhappy with it! I've been kicking myself for 3 years for putting in a tile floor (that I hate!) because I couldn't afford the wood floor I wanted. I foolishly told myself that we'd get around to upgrading it someday, but "someday" still hasn't come and I wish we'd just kept the floor the way it was until we could upgrade it properly. Live and learn. Ooo, we have such similar kitchen styles...I just might have to "pin" a few of these to Pinterest! i think the price looks really reasonable. typically, you could expect to pay about $9 a sq. ft. for new hardwood flooring. the general rule is that it is $3 for the material, $3 for installation, and $3 for finishing in place. at least that is what it seems to be in the midwest. so the fact that your price is less than that and also includes some demo work, i think it's a great price! 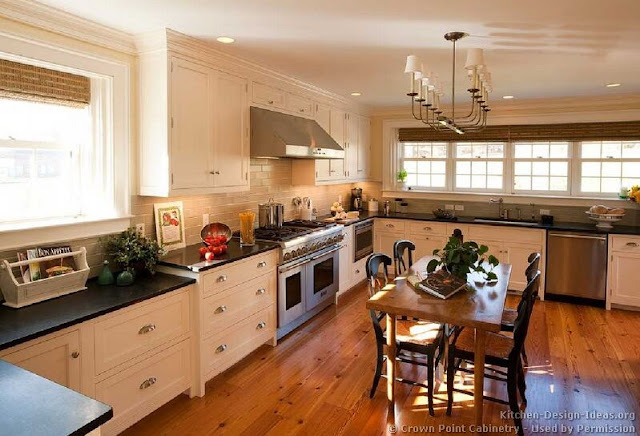 your kitchen inspiration is very similar to mine!! I have hardwood in my kitchen and I love it! I agree with the commenter who said that you should go ahead and get it if it's important to you. I hope you can reconsider and work in a slide-in stove, especially if you're getting new countertops. When my mom renovated her kitchen we found slide-in at a Sears outlet for less than $900. It's a bit more than the regular models, but it really creates a nice line with the countertops in your kitchen. This is too big a purchase to redo after the reno. I love hardwood in a kitchen. Go for it. I agree, you are saving elsewhere and the wood flooring will be worth it. It would be much easier to upgrade your stove in the future if you decide to, but the floors would be quite a challenge. DO IT. If hardwood is what you love I'm not sure you'll ever be really happy with something else. And this is going to be a heckuva lot of work and headache, so it better be worth it in the end! If you can swing it I say go hardwood. Go big or go home, right?? Since that includes floor removal, I think that is a pretty good price. I know we paid about $5-6 for #1 oak installed and finished. Our kitchen alone was $3000, and when we did the other rooms (floors installed in LR and refinished elsewhere plus stairs) it was closer to $4K. Grand total of probably 1,100ish SF though altogether. Do not skimp on something you want that much or you will regret it in the future!!! That's what I think anyway. Looks really fair to me. And it looks like wood is totally the way to go. I'm totally a fan of compromise, but if you love hardwood floors, this is the time to do it. Seems like everyone is going for the white cabinets, granite counters and wood floors with stainless steel. YAWN. Why not go against the grain and try some other combination? I think it's reasonable, especially if you know that's what you want. And better to do it now when you're redoing other things than later on down the road. You want the wood floors. A lot. Cheap out on fabrics, cheap out on fitting you can upgrade yourself later, eat off a folding table for a while and wait on furniture. You're going to look at that floor EVERY DAY and it won't be easy to change. And every day, the wood floor will make you happy :). Anon: I hear you, it is a very popular combo. What I love about it, is the timeless quality. Our house was built in the 30s and the white cabinetry and wood floors would be something you'd find in a house that age. 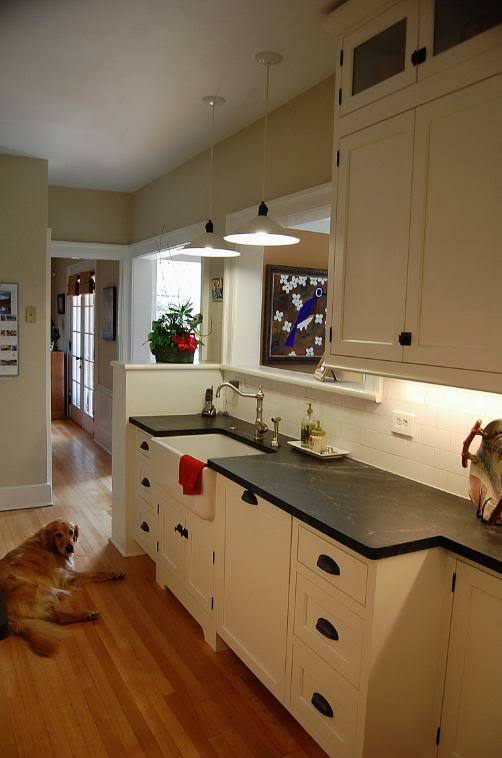 Granite, well, it's similar in price to other solid surface counters and I want something durable. 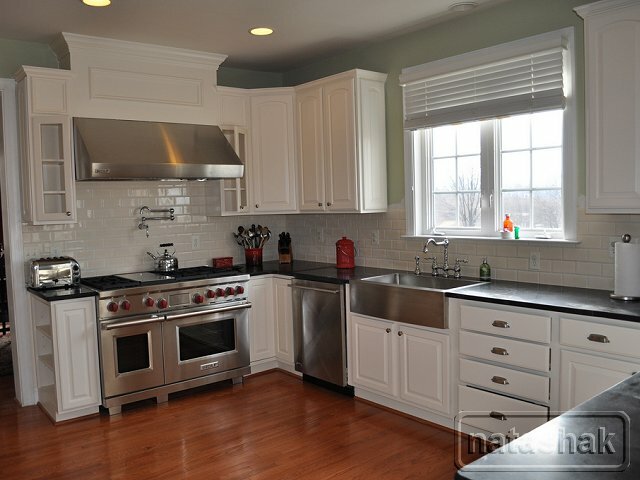 Stainless appliances are pretty standard in all new kitchens, so I don't consider that a specific design look. I know we will be trying to sell this house within 5 years, so I want a kitchen that will appeal to many people, unusual choices just aren't as easy to sell. Thanks for reading, I appreciate everyone's thoughts! 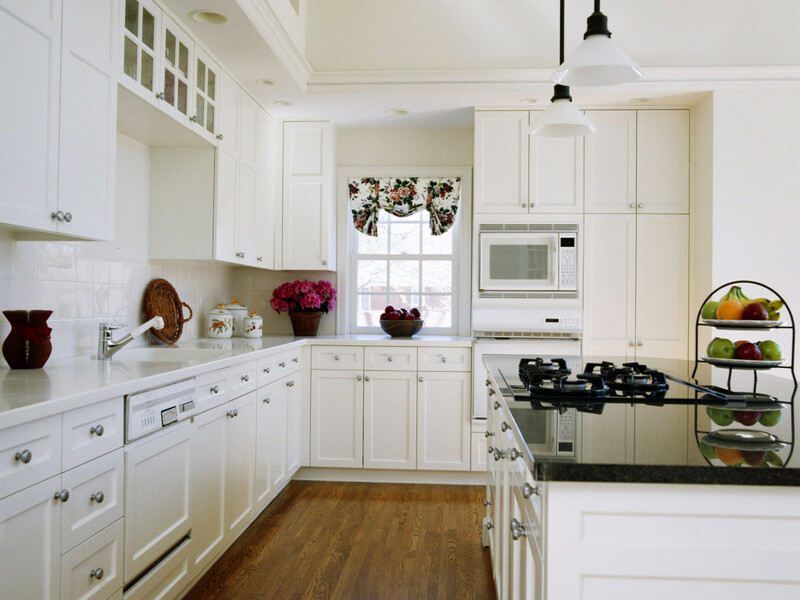 I don't know about Wisconsin, but down here everyone is NOT doing the white shaker cabinets, wood, etc. We just did a tour of new construction homes last weekend (to check out the competition, hubby works in construction) and out of the 30 houses we saw? Only two had white cabinets, wood floors, etc. 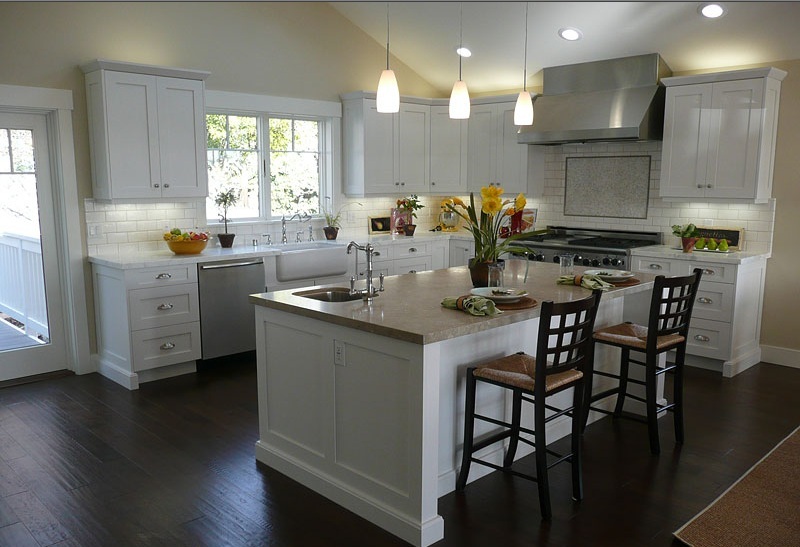 Everyone else was doing travertine tile, venetian gold granite, cherry cabinets, tumbled travertine backsplash. I commended the builders for going against the grain for the area. They were worried because the feedback they were getting was the kitchen wasn't "like everyone else" -- so there you go. I think what you're going for is going to be classic and fit in for your home, especially for the time period built. Our house was built in 1926 and we're doing pretty much the same kitchen as you. Except in like two years. When we're not broke. The quote isn't bad. I'd save $500 and rip out the floors myself, but I find demo therapeutic. I think you should do it. You're going to be living in the house and looking at the floors every day....you don't want to look back and wish you had done something different. If you're only planning on living there for five more years, why spend the extra money on the floors? You won't be able to reap it when you sell the house. YOu'll be putting way more money into the house than what you can get for it. I don't think the economy and housing market is ever going to get better. I love the wood too. You will live with this for a very long time, so if you can afford it I say go ahead. I'm just usually not a fan of spending so much money on something (even if you LOVE it) that you are going to look at it and say, "Stupid beautiful floors. We can't retire until age 80 because of you." However I doubt that's the case so follow your heart! That's what I do. THANK YOU THANK YOU THANK YOU! For posting the cost of the reno. So few reno blogs do this....which makes me love this blog even more. Folks out here recovering old sofas, getting curtains made, installing cabinets, buying chandys, redoing bathrooms...all kinds of reno foolishness is taking place and it's like, HELLOOOOO! Does any of this cost y'all money? If so, how much and where are you getting it from? Home equity line of credit? Saving? A fabulous inheritance from Aunt Mamie? Robbing a local Circle K? I mean, come on! What's it costing you and how are you paying for it? Yeah, I'm nosey like that b/c I like to know what I'm getting myself into before I go hog wild at Ikea not knowing what the cost is for INSTALLATION! Anyhoo, thanks for keeping it "reno-real." Wow... That $3,800 is reasonable, but jeez. Between that and your new driveway, ouch. But definitely better than paying for a whole new driveway! And better than compromising on flooring you wouldn't be happy with. I'm so glad I bought a house with re-finished kitche floors. I just had to have my house spot-tuckpointed to the tune of 3 grand. The house is 100% mine, not mine and J's, so the money came directly out of just my savings. Boo hoo. Now I can't get the sofa I wanted. Or any sofa right now, for that matter. The price we pay to be homeowners! Exciting stuff going on here! When we installed wood floors in our house...we put them in the kitchen too. They do get a smidge more beat up in that room but I wouldn't do it any other way. Looking forward to your progress.